One of the worst moments in family reunion history happened several years ago. Renee's sister, in a charitable moment, bid on the use of a houseboat at Bullfrog Marina of Lake Powell. To make a long story short the houseboat and the reunion was pretty much a disaster but good came out of the trip. On the drive to Bullfrog we drove through a place I had heard of but never really had much desire to visit, CAPITOL REEF NATIONAL PARK. After driving through the waterpocket fold, I was so impressed that I have had the desire to return and finally was able to with Renee and Niah. Our first day we made an epic journey to Cathedral Valley. Please read about this and look at the photos in the Cathedral Valley posting. After spending most of the day in Cathedral Valley we drove the scenic 7 mile road into Capitol Valley and arrived at Capitol Gorge. Capitol Gorge was a neat canyon with petroglyphs, and pioneer names that had been carved into the canyon walls decades ago. Unfortunately it seems that hundreds of other people had the same desire since, and have also carved their names, or fake petroglyphs onto the walls. 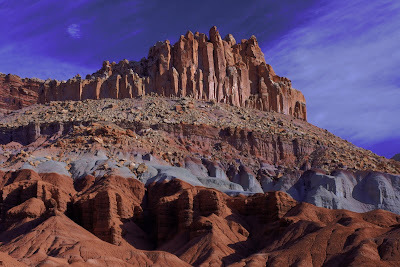 In fact I have never seen such desecration of a national park as I did at Capitol Reef and it is very unfortunate since it is such an amazing National Park. The next day we, after a miserable windy night, we hiked to a very scenic natural bridge called Hickman Bridge. The hike was ranked as moderate and only 2 miles round trip. I would suggest it to everyone who goes to Capitol Reef. 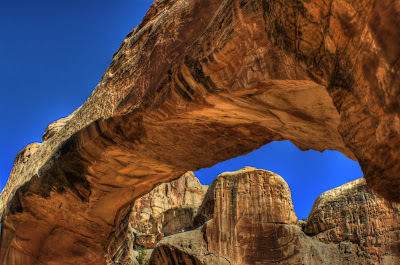 Not only is there a beautiful and photogenic bridge but also an ancient Fremont Granary, the remnants of a pit house and very colorful and uniquely weathered rock formations. We picked a truly magnificent time to visit this national park. The leaves of the Cottonwood tree's were changing and we were all left in awe from the natural beauty. 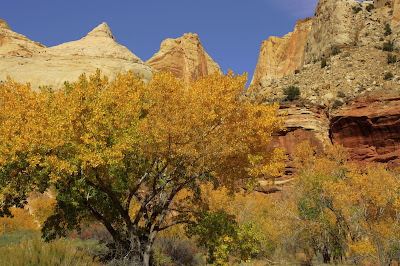 One of my favorite things that we were able to see at Capitol Reef were the HUGE, ancient cottonwood trees that had been planted by Mormon Pioneers. These trees were by far the largest cottonwoods I had ever seen. They were awesome. I think I said in another posting that I like tree's and maybe that is why I was so impressed by these trees. By far the best thing for me was to see 5 month old Niah totally acting like me! She would stare out the window of the car as we drove through Capitol Reef. It was hilarious! Even though she is only five months she was obsessed with cranking her head so she could see the high colorful cliffs and the bright fall colors. Your daughter is so beautiful, like Renee! What a cool place. I'll put it on our "must see" places for my family to travel to. 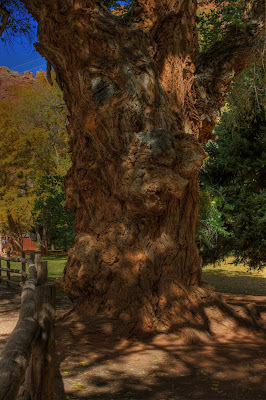 Very cool narley old trees!